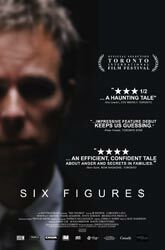 Six figures, (as in salary) is the impossible Canadian dream that wears down, and ultimately breaks its hero. JR Bourne plays Warner, a thirty something father of two, who works long hours at a thankless job. For Warner nothing in his life is up to snuff; he drives a wreck of a car, while his neighbors in Boomtown Calgary, drive smart sporty autos. It`s not just his thread bear clothes, but his shoes, his house, even his four year old daughter, are all constant reminders of what it means to be second rate. Deeply envious, he watches as everyone outside of his own family thrives. Will jealousy send him mad? When his overly ambitious wife Claire, (Caroline Cave) announces that she too might be close to unemployment, the back of her head mysteriously meets with the wrong end of a ball peen hammer. Although she survives the attack, her memory doesn’t. Since Claire is unable to conclusively finger her attacker, her mother takes up the slack, pointing the blame directly at Warner. This is of course, to be expected from the mother of a daughter who`s been attacked. His friends though, are not so sure that he`s altogether guilt-less. Warners’ parents too are doubtful of his innocence. Did the pressures of trying to achieve the “Canadian dream” cause Warner to snap and attack his wife? Only he knows for sure.